Seattle decided to greet me in traditional Seattle style, and by that I mean I got absolutely soaked my first day there. It reminded me why I had quit wearing glasses – raindrops on the lenses are really annoying. But the city was beautiful as always. Seattle doesn’t have a defining architectural style. The city is a mish-mash of shapes dependent on the era each region was built up in. The Pioneer Square area is perhaps the most uniform, and the oldest. 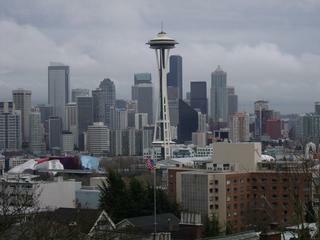 Downtown is largely 1960’s and 1970’s square boxes, though the Monorail and Space Needle are of the same era. Belltown, between downtown and the Space Needle (at Seattle Center), is gradually evolving from low warehouse buildings to midrise condominiums. 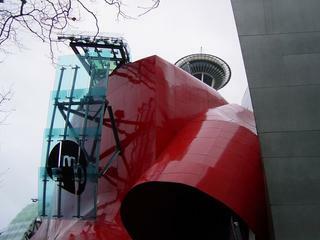 But Seattle has never been afraid of innovative architecture. Witness their plans for Monorail station designs. 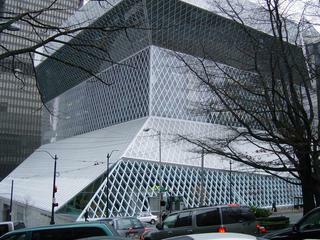 Take a look at the new Seattle Public Library. Even the old buildings have some creative flourishes. 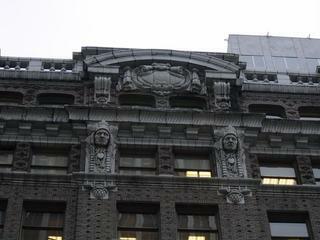 Look at the Native Americans and pinecones on the top of this old building. 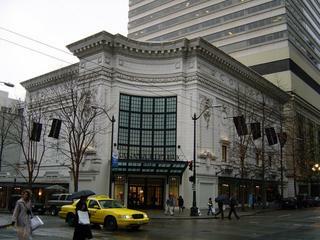 This old building was revitalized and turned into a (eek) Banana Republic. 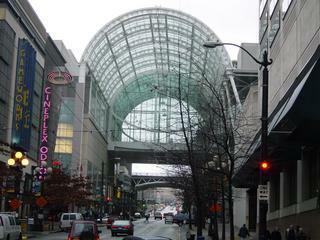 And back to the new and modern, we have the new pedestrian arch at the Washington State Convention Center. And of course, I LOVE the Experience Music Project. 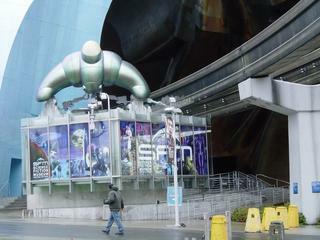 The EMP has a new co-resident, the Sci-Fi Museum. While in Seattle, I discovered that Seattle is one of the latest cities to decorate small animals and distribute them all over town. I’ve seen some cities do cows, some pelicans – we did hearts here in San Francisco – but this has got to be the worse yet. 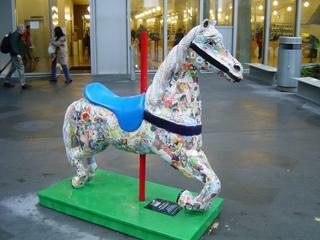 Whose idea was it to do ponies? I enjoyed my time in Seattle, especially seeing old friends and family, but it feels less like home now and more just like a city I can visit where I’m familiar with the streets. There are many things that I love about Seattle, but its secrets are once again hidden from me. It’s hard to imagine falling in love with San Francisco like I did with Seattle, but ya never know, SF is slowly growing on me.